After spending a lot of time at my yoga studio in the month of January, I thought I would write a post about what to do and what not to do when attending your first yoga class at a studio. 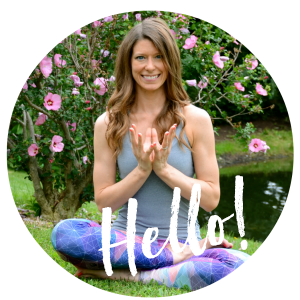 I’m also hoping that I might have convinced a few of the runners who read my blog to try out a yoga class with my benefits of yoga for runners post, but you might be a little nervous about going to your first class. A lot of newbie yogis are relatively well-versed in what to expect, but if you’re thinking about going to a yoga class but you’re nervous about going, hopefully some of these suggestions will put you at ease. Disclaimer: I’m not a doctor or your yoga teacher, so please take the advice over your medical professional or your yoga teacher over anything I say here. Please don’t hurt yourself! I see a lot of nervous beginners come to classes looking very self-conscious. They immediately head to the back of the room. (Which at my studio is right where the heat comes out of the ceiling and is the hottest spot to be–not exactly the easiest place to practice.) What they may not know is that no one is judging them for not being able to get into advanced poses because we were all there at some point. Yogis want everyone to feel comfortable and to come to love yoga as much as we do. We don’t come to our mats to judge each other, we come to our mats to find that meditative space. Besides, the really limber yogi next to you is concentrating more on her own form than yours. Starting in a slower paced class is never a bad idea, especially if you’re really new to yoga. Often classes for beginners will address more corrections to alignment which will help keep you safe on your mat and make it less likely that you’ll get injured. (Keep those elbows in on your chaturangas!) You might also feel more comfortable at a beginners’ class, allowing yourself to relax more and letting your mind go, which is the core of yoga. If you do find yourself at an all-levels class, just take it easy and modify when necessary. I can’t stress this one enough, especially to you runners who may be thinking about attending your first yoga class. Runners tend to be very tight in the hips, hamstrings, and other areas of the body and stretching too much can actually hurt you. You should never feel pain in a yoga pose. If you do, gently back out of the pose. In the style of yoga I teach, child’s pose is always an option and I always encourage my students to come back to child’s pose for a few breaths if they need to reconnect their minds with their breath. Some studios will charge you if you want a bottle of water, if you need to borrow a mat, or for other things you might need for class. (My studio doesn’t, which I love.) Check with the studio you plan to attend to find out what their policy is and to find out what you should bring to your class, or make sure that you’ll have money to get the supplies you need. If you haven’t tried yoga yet, it’s a really wonderful way to cross train. I’m looking at all of you runners! Adding a yoga practice as cross training can really improve your running, and it can also really improve your state of mind. Try it out! If you’d like to read more great yoga poses for beginners, check out my posts on the best yoga poses for true beginners and experienced beginners. 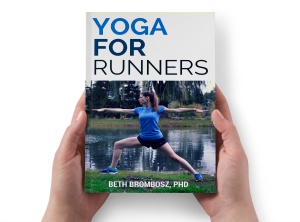 Also, sign up for my newsletter to receive free yoga and running tips! Athletes: if you haven’t tried yoga, what’s holding you back? Have you found that yoga has helped you in your sport of choice? Love this post. I’m definitely motivated to start practicing yoga again. I took a weekend long therapeutic yoga class for physical therapy continuing education a few years ago and loved it. I now incorporate a lot of the asanas into my patients’ sessions. That’s fantastic! I’m glad yoga is able to help your clients. A lot of the exercises I had to do in physical therapy reminded me of things that I do in yoga. Have a great weekend! I’ve been trying to get back into a regular yoga routine. Wow it’s hard after you take a break! Great tips! I always try to get to class early because I hate coming in late! It is really hard, but luckily it comes back relatively quickly! I’m always at class early, too. I hate being rushed and I don’t want to walk in late, either. I am so excited to do a workshop on matras at my studio this weekend! That workshop sounds like a lot of fun! Hope you have a great time! Great tips! I agree that with any workout program you must listen to you body, especially if you are a beginner. This keeps you safe and lowers your risk to injury. Thanks for sharing your advice!